Thank-you, Lesley! Your nomination made me smile and gave me warm, glowy feelings. We’re right in the middle of the rules as we speak. Read and be enlightened or at least enjoy the way they’re set out in a numbered list, if that’s your thing. 3. Share seven facts about yourself or list three things that inspire you. As much as I love the number seven (and I really do – I was excited to discover that my new postcode has a seven in it, which I’m pretty sure is not a thing that would excite normal people), I’m going to go with the three things that inspire me because it has been fun to think about what really makes me tick. Inspiration No. 1: The Past. For as long as I can remember, I’ve been obsessed with history but not the sort of history that involves kings and queens and Important Dates and Battles. No, I’m far more interested in the way ordinary people lived: the way they sheltered themselves or cooked or even washed their clothes. One of the reasons I love knitting from old patterns is because it gives me a massive connection with the past. As my needles click away, I feel like I’m sharing a moment with the person who owned the pattern originally, or to whom the needles belonged before they ended up at an op shop. Why yes, history was my second favourite subject at school. (English was my first – see Inspiration No. 3.) If I weren’t so busy knitting and sewing and generally making things in my spare time, I’d set myself up as an amateur experimental archaeologist. Inspiration No. 2: Making Things. Is there anything more rewarding than making things yourself? Apart from a four tier chocolate cake with a cream cheese chocolate filling, I mean. That’s pretty rewarding. Yes, making things yourself takes far more time than going to the shops and buying it instead but it’s roughly one million times more satisfying. I’m not even content with making things from wool or fabric; this weekend, I’m going to make crumpets. This apparently involves waiting around for an hour while mysterious yeasty things happen to the mixture – an hour in which I’ll just be hungry for crumpets. They’d better be amazing, is all I’m saying. The best thing about making things yourself is that anyone can do it. I always feel guilty when people praise me for knitting a cardigan or making a dress. “I just followed the instructions!” I protest. Seriously. Anyone can do that. I still remember the way I felt after writing my first story as a six-year-old. I want to do that again, said a voice in my brain, which is something a six-year-old takes in her stride (up until she starts to wonder if normal people hold conversations with themselves in their own heads). Books and stories and words have been part of my life forever. I was so good at reading in Grade 1 that I had to be sent to the Grade 2 class for silent reading because I read my way through our stack of silent reading books in a couple of weeks. It was inevitable that I’d go from reading to writing. I love words. I love the way I can make them obey me. I love the way I can understand their power. And I really should get on with finishing that book I’m writing. 4. 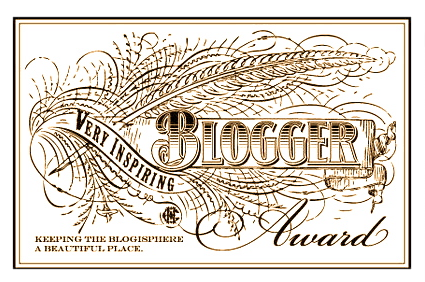 Nominate other amazing blogs and comment on their blog to let them know you nominated them. This is the point at which I fail because I am guaranteed to leave off a blog I love or worry about offending people whose blogs I don’t choose. Ideally, I’d like to list pretty much every blog I read, but you’d be going through it forever and that takes away from time when you could be doing vital things such as eating or knitting, whichever has greater priority for you. You could always check out my Recommended Reading page, if you’re interested. In the meantime, I may need to work on adding a blogroll to my page – I always find the best new blogs by checking out other people’s blogrolls. Basically, I’d like to thank you all for being inspiring. I love catching up on your blogs and seeing the amazing things you’re making or the fantastic places you’ve been. It always makes me wish I could spend all day making things and taking photos of what I can only imagine would be a highly blog-worthy life. In the meantime, I’ll just keep stealing all the time I can to make all of the things and formulate Plans for the blog. Yup – blogs like this is why I nominated you. So long and thanks for all the fish. Happy to oblige. 😀 Thanks again for nominating me. Congrats! I actually passed your name on to Vinnies recently for the black coat styling challenge as I know you love opshops but I couldn’t recall you’d ever done any modelling on your blog so wasn’t sure it would be quite appropriate. But they have your name for future reference! And funnily enough, a friend of mine who is also called Katie has just started making crumpets.. it must be a thing. She used to work at Disney so she made them in the shape of Mickey Mouse heads. That isn’t necessarily a thing though. Oh wow, thanks! I’m not sure I do modelling so much as standing in front of a camera and acting like a loon, but it does happen occasionally. 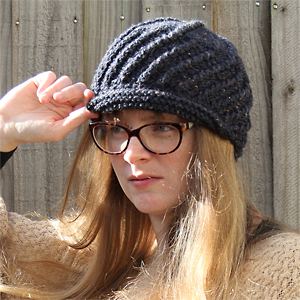 (There are actually a few recent makes I need to share but the need to pose outside has been putting a bit of a dampener on it, given the ridiculous levels of cold lately.) I love Vinnies stores so I hope I do hear from them eventually – it would be great to support them. Katies and crumpets go together. It’s the sneaky alliteration we like. 😀 And the crumpets. Turns out home-made crumpets are even better than store-bought ones, and I already thought they were pretty excellent.